I don’t do technical reviews of films. I’ll say I’m more of a reflective viewer if there’s such a term. I consume this genre of art on a more personal and introspective level. Kind of seeing whether they’re relevant to life circumstance or not. And this film, Philomena got me several notches up. It is one of those films that recount discourses that cuts across cultural, social, political and religious attribute of our human existence. I wasn't able to read the book. Not a copy available in any local bookstores around here. I was one sad bookie (I’m no worm, seriously, I hate that term) but glad there’s this screen version and I’m hoping this adaptation did justice to the written one. 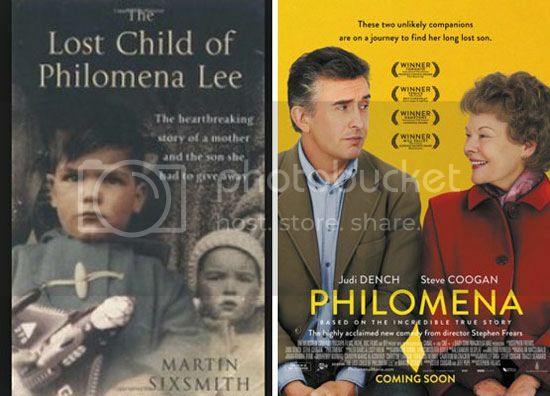 Warning major spoiler :) The film was based on the account of Martin Sixsmith’s book ‘The Lost Child of Philomena Lee’. Martin in the movie was played by Steve Coogan. In the movie, he was a journalist who was fired from work because of a scandal he has nothing to do about. He was contemplating on his next career move to try to write Russian History but it has changed dramatically when he met a waitress at a party who asked him to do a human interest story about her mom who was painstakingly trying to find her lost child for 50 years. Philomena (played by Judi Dench) on the other hand, was an Irish woman who at the young age got pregnant out of wedlock. And in the early days, women who bear children out of vows get dreadfully ostracized by society like they’ve killed half of humanity. Just how awful was that? Eventually she was brought to work with the nuns while attending to her boy child and get to see him at least an hour within a working day. Until his son was taken away by an American couple which apparently has the highest bid for the kid. We hear stories of life, happy and sad, every single day of our lives and Philomena’s story was one of those sad stories, we could only hope it won't happen to us. One of those stories that was weaved so exceptionally interesting yet so dreadfully disclosed - we tend to question the elements of our system, what the heck just happened? I love Martin in this story. He represented people who knew that there is super power over and above us, but doesn’t believe that it is necessarily God. Philomena on the other hand is a relatable human character. Her faith evolved over time. From being a deeply religious individual to being a secular believer who forgives those who sinned against her, not because it’s a moral obligation and a command from God but because she doesn’t want to get stressed thinking about life baggages and all. This film firmly elucidates how believers question not their sufferings. Believers believe it happen because it’s an atonement for our sins – and getting pregnant out of (f@*$king) wedlock is abso (fu*#king) lutely a sin. Hence, you have to do penitence for it. Glad I was born to this generation. Philomena: "Now we're getting closer, all these years wondering if Anthony was in trouble or prison or goodness knows where. But as long as I didn't know I could always turn myself he was happy somewhere and that he was doing all right." Philomena: "What if he was obese?" Philomena: "I watched this documentary that says a lot of Americans are huge. What if that happened to him?" Martin: "What on earth makes you think he'd be obese?" Philomena: "Because of the size of the portions!" You should watch this! It's a deep, scarred and haunting story of human experience. Hope you'll come back and share your thoughts with me after watching ... Would be glad to read your comments.